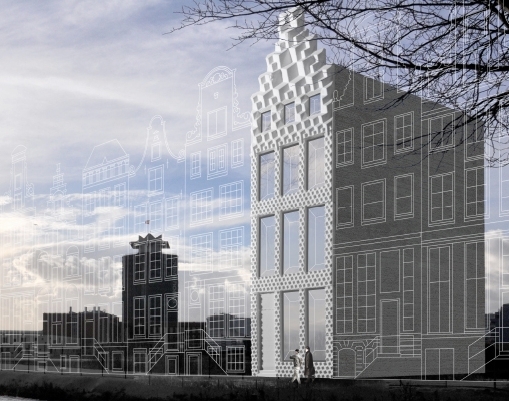 Built in a once industrial area of Amsterdam, overlooking one of the city’s many canals, stands the Dutch architecture wizards, DUS Architects’ latest 3D printed project. Anfang 2016 haben die Niederlande die EU-Ratspräsidentschaft für die erste Jahreshälfte übernommen. (3DHubsBlog) Ten 3D Hubs communities joined forces to 3D print the 220 orange blocks needed to build the world’s first miniature 3D printed canal house. Each of the blocks represents a full build for a 3D printer platform. The miniature 3D print canal house is a replica of the large-scale 3D printed canal house designed by DUS Architects, which is currently under construction in Amsterdam. Although the miniature replica was big enough for kids to play inside, it isn’t just some tourist-trap or gimmick. The 3D printed house links history with future innovations and research by demonstrating how 3D printing techniques can offer solutions to housing questions worldwide.